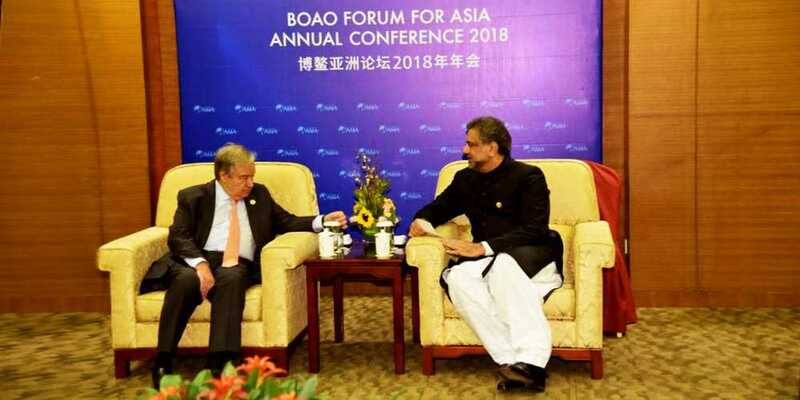 Prime Minister Shahid Khaqan Abbasi has met with the Secretary General of United Nations António Guterres, during which he raised the issue of Indian brutalities in Kashmir. Foreign Minister Khawaja Asif has shared a picture on social networking website twitter according to which Prime Minister Shahid Khaqan Abbasi is meeting with the Secretary General of the United Nations António Guterres. Khawaja Asif mentioned in his tweet that Prime Minister Shahid Khaqan Abbasi raised the issue of Indian brutalities in Kashmir during the meeting. According to Khawaja Asif Prime Minister Shahid Khaqan Abbasi urged the Secretary General of the United Nations António Guterres to play his role to stop the brutalities and killings in the Occupied Kashmir.